Versey or Barsey of West Sikkim is almost an unexplored valley of flowers. It looks magnificent in Spring with the blooming rhododendrons flowers. Versey is famous for ‘Barsey Rhododendron Sanctuary’ that you can find only by trekking from Hilley to Versey. The Hilley – Varsey hike is a no sweat trek that you can complete within a day or two. If the sky is clear, you can see Mt. Kanchenjunga clearly throughout the trek-route. In April when the Rhododendron blooms, the Versey looks like the “Fire on the Hill”. How to go to Versey? Versey is 10,000 feet above the sea level and only 4 Km from Hilley. The nearest Railway Station is New Jalpaiguri (NJP). We went Hilley from another beautiful location, Okhrey. From Kolkata, We took the Darjeeling mail and reached NJP in the next day morning. We took an auto-rickshaw from NJP to go to Payel Cinema of Siliguri, from where we got a shared cab for Jorethang (Sikkim). From Jorethang, we bored into another shared cab for Okhrey. Okhrey is the base point of this trek. After an overnight stay at Okhrey, we went to Hilley that is only 20 mins journey. We started our trek from Hilley towards the Versey. There are very few homestays in Okhrey and Versey. In the season, those almost full. So, you have to pre-book your Homestay. You may choose to stay at Trekker’s Hut or Guras Kunj (run by Bondhu Sherpa) in Versey. These costs around 900/- per person per day per head with food and lodging in the dormitory. Best time to go Varsey Rhododendron Sanctuary is from 1st April-25th April as the best view of Rhododendron is in Spring season. Versey is called the Land of Gurus. You can see a different kind of Rhododendron in this sanctuary. Not only the Sanctuary, but the riot of colours of the blooming Rhododendron spreads also the whole Hilley-Versey trail. You can not imagine how many types of butterfly you can see in this walk. 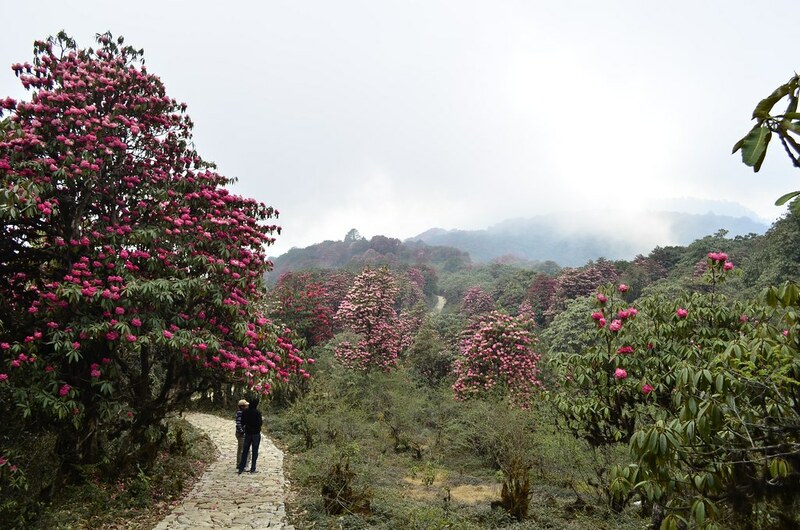 The Rhododendron Sanctuary stretches across an area of 104 sq. km along the Singalila Ridge which forms the natural boundary between India and Nepal. The dense forest of Varsey is covered with Hemlocks, Silver firs, Magnolia and rhododendron trees and bushes. This is also the place of Beautiful Himalayan Birds. I just amazed to see the variety of Himalayan birds. If you are lucky, you can see the Red Pandas in the forest. Apart, from Rhododendron, you can see many unnamed wildflowers and the fragrance of those flowers is so hypnotic that sometime you may feel you are losing your sense. This is not only my feeling but, the locals also said the same. The fragrance of Rhododendron has such power if someone smells it closely for some time, he or she can lose his or her sense. Best Time: 1st April to 25th April. From Hilley, you have to take permit for the Versey trek as it is the border area. This small trek is not hectic for the children (Not less than 7 years). You can visit Pelling and Kalukof West Sikkim from this place. If you are not a nature lover, you cannot enjoy the silence of nature, don’t go to this place. This is the place of pure nature lovers. I visited this place 3 years back when I didn’t take photography as a serious hobby. So, the all memories of colours, I have kept in my heart only. Please correct this sentence You can not how many types of butterfly you can see in your walk. Ohh! sure! will do it. Thanks a lot. Gorgeous place. I love the photographs.